The reflection targets my disfigurement. If only the borders of this mirror could protect the rest of the world from my hideousness. My life’s insignificance rampages through my thoughts like an atrociously loud party that never ends. Nothing I do is good enough. I want to expunge my existence on a daily basis. Not even daily. Every damn second. With this mirror as my echo, I am repulsive. How do I disappear from my inadequacies? With countless years of too many pills mixed with too much alcohol under my belt, what is next for me? What else can I do to escape the infernal knowledge that I am worthless, that I will never be enough? I have already attempted suicide once, and I even failed at that. Every time I think about it, my one chance at escaping this ghastly life, I feel betrayed. My heart stopped that day. Clinically, I died. Yet, here I am with the mirror trapping my brittle existence in its cage, framing me for another attempt. I cannot bear to take up too much space in this world. I do not deserve it. I am not worth it. Standing in front of the mirror every morning, I check myself to make sure I am small enough to exist. It is better to feel hollow than to feel anything at all. Even the feeling of food in my stomach is too much to allow. The void is my only comfort. My only confidant. Before I lay my skeleton to troubled rest every night, I look at myself again in the mirror, waiting to die. I am nothing but skin dripping off bones like cheap clothes drooping from wire coat hangers. And still, even the air in my lungs takes up too much space. I looked down at the paper in my hands. The vague directions given to me by Chris, someone with whom I had spent less than six hours, were sketchy at best. I wagered the pros and cons: Drive seven hours, become terribly lost in the middle of the Utah desert, lose cell phone service, and my sense of direction—I might end up thoroughly enjoying the experience. Or, I could foolishly deliver myself to my will-be murderers. End decision: Whatever. I am in. It had been three days since I excitedly dropped everything for a spontaneous adventure. Looking down at my hands again, I saw that they were swollen and wrapped in a dismal representation of skin well held together as they gingerly gripped the steering wheel. I could not believe how bruised and battered my entire body was, but I had crawled out of the Canyonlands in one piece—well, relatively one piece. Images from that weekend with three wonderful strangers began to cloud my vision like a torrent flash flood. For the first time in my life, I taped my hands, put on a harness and climbing shoes, slung a chalk bag around my waist, and threw myself at some gorgeous sandstone crack. My soul was imploding with a fierce vivacity that I had never experienced before. Fill the void. Fill the void. Fill the void. Those three monumental words acted like a firing squad in my body, allowing my heart to seep all of the ignored emotion locked up inside. I began thinking about how I had never in my life been on an adventure like the one I was returning from. When I was little, there was no room for play, no time for myself, and no outlet for my emotions into nature. Before embarking on this complete immersion into nature, my mind was high-strung and wired for a downward spiral fully saturated with depression, self-deprecating thoughts, and an overall under-enjoyment for my desolate excuse of a life. And before I knew it, the flash flood was trundling down my face. For the entire hour it took me to drive along the byway that sided with the Colorado River, an entropic catharsis ransacked everything I knew about life. Where was the negativity? I realized I had never lived in a moment, let alone days on end, where absolutely no negativity existed. No, not even in thought. Never was I once told I was not going to be able to climb a crack. Never were there any utterances of not being strong enough, not being capable enough, not…being enough. Instead, there was praise and support, laughter and enjoyment. And then came the kicker, a more profound recognition: I ate. I ate and I digested and I did not analyze it once. The thoughts deepened themselves into unknown crevasses as I realized I spent an entire three days devoid of obsessing over body image, being attractive, attaining a certain look to appease society, or to satisfy my own hungry thoughts for what I delusively deemed to be beauty. So I wept for what seemed like hours, making a blubbering mess of my face. Somehow over the weekend, I had managed to escape myself, my destruction, and the monstrosity of a disease that consumed 90 percent of my daily thought process. At this point, the last five and a half years of my life were ruthlessly defined by bitter trench warfare with an eating disorder. If there are on average 8,765 hours in a year, I figure I devoted about 36,200 hours of those years mentally and physically degrading my health. With that degradation came the downfall of my confidence, my livelihood, and my wish to discontinue with a life I had only credited with a disgusting amount of worthlessness. Yet, in this one meager hour, the last 48,208 hours of my life unraveled. In all honesty, the state of my malnourished body should have prohibited me from the activities of the weekend. Yet, I was successful. Foreign sensations washed over me leaving goose bumps in their wake. I found a reticent, subtle, and exotic piece of myself sitting, waiting patiently and quietly, to be discovered in the middle of a crux, a one hundred-degree hike, an amazing meal, terrifying exposure, and little moments of time so readily given to me by mere strangers. I was proud of myself. I felt tough. I felt respected. I felt like I deserved to eat. I felt beautiful. For the first time in years, I discovered a glimpse into the meaning of true health. I finally saw a way out of these shackles that bound me. I was accomplished. It was as if Indian Creek preserved a piece of me in its air-conditioned cracks that I had no knowledge of. Over the weekend, I discovered it and wholly felt it. Afterward, it took a few days to digest the pieces of myself that I found perched just below Bandito anchors or in the depths of a crack. I unearthed strength. Strength. Physically and emotionally and mentally, I observed a soft and delicate strength that has a ferocious passion I never recognized before. Even more, I did not know it existed. And in the end, this is not a story about climbing. It is not even a story about an eating disorder. Rather, this is the hour I began to love myself for the first time. This story was originally posted in the Climbing Zine. 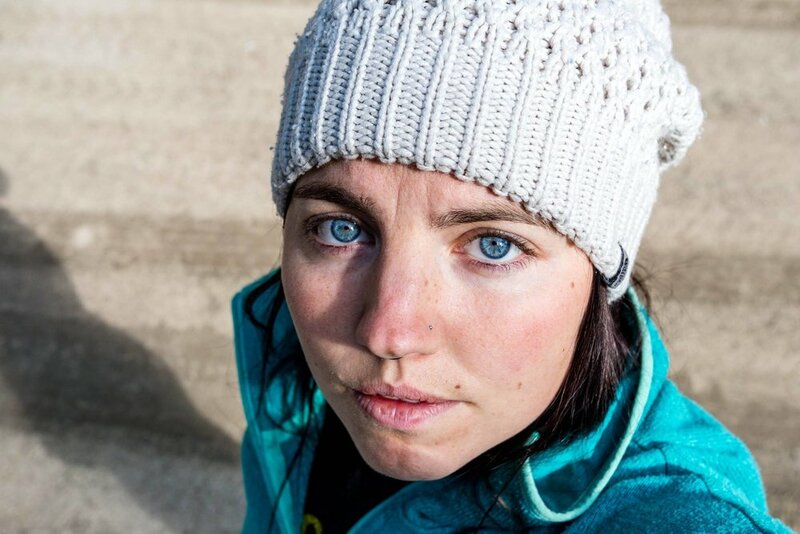 Shay Skinner embraces the identities of being a writer, climber, and outdoor adventure photographer. She’s also semi-famous for turning a Clif Bar wrapper, a Smartwool sock, and climbing tape into a tampon while on her first big wall in Yosemite. 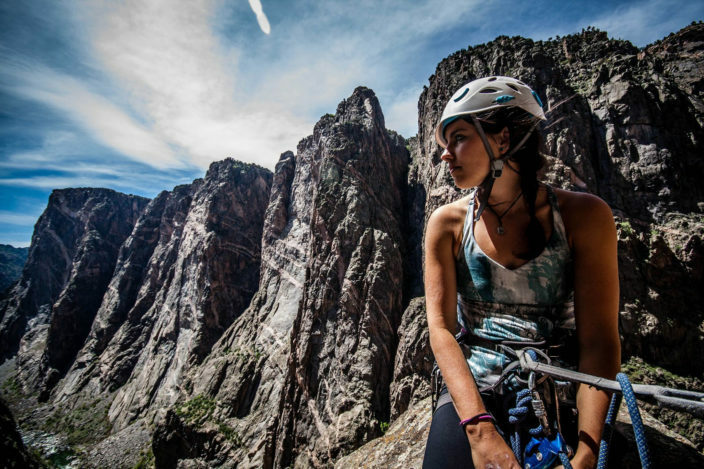 Beginning her climbing career in Indian Creek, six years ago, it quickly became the place she turns to for emotional refuge and healing. To see more of her photography and to experience more her journey through life, struggles, and vulnerability, her blog can be found at skinpoetryphotography.wordpress.com.